For a limited time, buy 10 EMS Grid vials, get 3 EMS Grid vials of equal or lesser value free! Contact info@emsdiasum.com or sgkcck@aol.com to take advantage of this offer. A reliable support specimen grid source. Features: well-defined grid bars, maximum open area, and a matte/shiny side. Each grid is individually inspected. 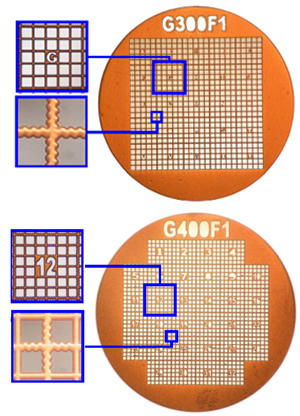 Newly introduced are copper grids with palladium plating. This plating offers better grid strength and avoids tarnishing. Also new are Copper-Rhodium (Cu-Rh) grids in mesh sizes 200 and 300. * The price for quantities of 10 or more vials will appear as the single vial price in the EMS shopping cart. An adjustment will be made to the cost by the EMS customer service when the order is processed. 1 A thickened version of the standard, G200TH with an assymetric center. A mark on the rim allows for precise orientation of the grids. 2 A combination of thin and thick bar grids, with a mark on the rim for orientation. 3 The handle is designed for ease of handling and is easily removed if necessary. To remove the handle, just bend it over on a 90 degree angle. 4 Thick bars dividing regions into 6 thin bar areas, which are identified by a numeric system. 5 Thick bars dividing regions into 9 thin bar areas, which are identified by alphabetical letters located in the center of the grid. 6 Each of the 322 grids squares, can be identified by reference to its unique combination of base 2 binary number and alphabet symbol (A-T). 0 is a short rounded solid pillar and 1 is a longer rounded solid pillar. 7 The block of 625 (25x25) individual cells is divided into smaller blocks bounded by thicker crenellated bars. Each small block of 25 cells has a central alphabet letter from A to Y for identification purposes. 8 The block of 1152 (32x36) individual cells is divided into smaller blocks bounded by thicker crenellated bars. Each small block of 36 (6x6) cells has a central number from 1 to 32 for identification purposes. Thin Bar Grids have been developed using a new technology to produce ultra-fine grids with thinner cross bars than regular grids. The result is equally firm specimen support, but with 40% more open area for viewing maximum specimen surface area. Mesh TVM-Cu 100/vial Combined:150, 200, 300, 400 mesh. In addition to our square and hexagonal mesh Gilder Thin Bar Grids, we are now able to produce a very fine mesh that values up to 2,000 lines/inch. There is an increasing need in TEM for support thin films, routinely carbon, as thin as 1.5 - 2.0nm. The pitch (the distance from the center of one bar to the center of the next bar) dimension in all grids remains constant, which allows them to be used as a lower magnification calibration aid. 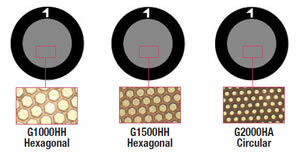 Type T601H(hexagonal) and T601(square) represent our efforts to reduce the grid bar width (only 5 microns) enabling more of the specimen to be viewed. All new types, apart from one side being shiny, the other matte, have a large asymmetrical mark in the rim which gives the identification of which side the specimen is on. 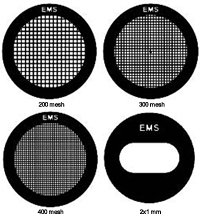 Grids are 3.05mm overall diameter; 2.05mm mesh area diameter. We have extended our range of TEM grid materials to include four types, which are now available in Molybdenum. The new products are manufactured using a process known as chemical "milling" (etching) instead of the more familiar technique of "electroforming" (deposition) that is used in the manufacture of copper, nickel and gold products. Molybdenum is used principally in applications where it's high temperature, hardness, expansion of coefficient and corrosion resistance characteristics are considered important. The material which is used has a purity of 99.9%.